I felt that something was wrong. My Harmony strength was in full alert, stage 5, alarm bells ringing. All was not well. But what was it? What was wrong? When I called my boss to talk about a project he said, “Just send it to me, it’s faster for me to do it myself than to talk with you about it.” What?! But wait…I’m a verbal processor, I talk about my ideas until they become clear. Communication is my #2 Strength. And so the unpacking began. It began with the alarm bells that rang out a warning. And it ended with my first ever negative performance review, chock full of all the things I needed to improve. Before this role, I’d spent twenty years working in my sweet spot, using my Strengths without even knowing it. When I started working with Lisa, it was out of curiosity for what she was doing. We were former colleagues, and she’s one of the smartest people I know. I wanted to learn about what it was that she loved about Strengths. Little did I know how this work we started on my whim was something that would drastically change my life, my work, my marriage and the way I look at myself. Like any epic love story, when mine came to an end it was like a hurricane. The hurricane swirled around and served up reflection: how could I have done this differently? Self-doubt: what did I do wrong? Horror: I can’t believe I sat by and let that happen. And in the end…revelation: Aha! Now I understand what was happening! My Communication strength had been a blessing in my previous jobs, a strength that helped me succeed in training and sales enablement roles. Communication was my sweet spot…until I found myself working for someone who didn’t get me. Every time I said, “Let’s scope that out by talking to the team,” he said, “Don’t ask them what they want, tell them what they want.” Should I really come up with a solution without talking to anyone on the team about what the problem is? So my Communication Strength was criticized as a weakness. I was criticized for not being a leader. Asking questions, getting input, and collaboration were not seen as leading. It was because of my work with Lisa on my Strengths that I was able to do what needed to be done: leave that job. But it took a perfect storm to wake me up and make me see why I was unhappy at a job that looked perfect on paper. If you were to choose the best way to erode your self-esteem, obsessing over your weaknesses is it. Without investing in Strengths coaching, I would probably still be in a job that forced me to strengthen my weaknesses and diminished the value of my strengths. Naming each Strength helps me quickly see how my tasks fit into what I do well and where I need to get help. I use my Input Strength to collect and curate information in unique ways. Then I use my Communication Strength to share that information. 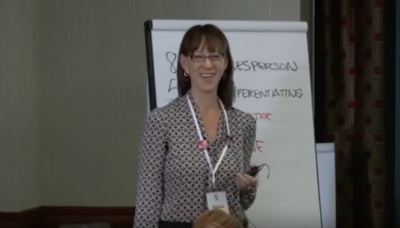 I teach through unexpected stories, resources and examples that authentically connect. I’m able to suggest unique ways of problem solving and make suggestions in ways that sooth (Harmony) and convince (Woo) but can shift as needed (Adaptability). When I received that negative performance review, I was left with this: I can work to change things about myself to fit into this job. But in the end, I will still be me. You don’t want me, the essential me, a combination of these strengths and weaknesses. And you know what? I’m totally ok with that. There’s a part of me that wishes I had been able to articulate this to my boss at the time. But it took reflection to get me to this place, a place that was not clear to me then, a place where I’m clear about what I do well and how I can add the most value to a new venture. Communication with customers: Customers like to work with people they like, but more importantly they like to work with people who like them. What can you say to show your customers how much you like them? Hint: it has to do with what you ask, not what you say. Communication with your team: Team members, both your colleagues and your direct reports, like to be heard and acknowledged. If your Strength is Communication, use it to share what you notice about them. Use compliments to acknowledge. I’ve used my Communication Strength to write helpful communication tips, including how to use compliments to change the world, one conversation at a time. Communication with your boss: Your boss will appreciate your Communication Strength when you show him/her how useful it is in building rapport and collaboration to get things done. If I had used my Communication Strength effectively, I would have shared some statistics about the value of collaboration to build solutions that work. Communication is a Strength that can be used to enlist allies who will support your ideas and projects, making it more likely that they will succeed. And every boss wants good results. My big mistake was not being able to articulate the value in my Strengths. By reading this, you’re way ahead of where I was back then! 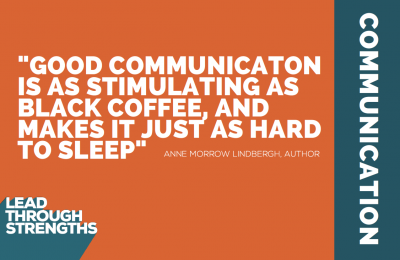 Communication strength helps you find the words that appeal to other people in the way that they find value. I remember a sales meeting that I participated in at the very beginning of the new job under the new boss. I was in my element, teaching, coaching and guiding our sales team. I felt happy and alive, confident and clear. Using my Strengths in all their combined glory: coming up with ways to teach (Input), coaching and encouraging (Communication and Woo), soothing the disparate team members through compromise (Harmony) and switching things up at the last minute when it was needed (Adaptability). That was one of the most fun and happiest times in my career, and one that I think back on when it’s time to reflect on my value. This is the memory that motivates me to keep going, knowing that operating from these Strengths is the way for me to have a positive impact in people’s lives every day.